We had so much fun on Sunday at the Canine Carnival! We helped dozens of doggies cool off in our doggy pool and with some tasty (to dogs!) sno-cones. We heard lots of dogs were adopted thanks to the record-breaking crowd. Thank you to everyone who came out. And don't forget to LIKE us while you're there! Smiles and sno-cones aside, we did have to put on our Emergency hats for some not-so-fun business: the business of helping our pets feel better. We were lucky to have some of our best emergency folks right there to help a couple dogs who had a hard time with the heat. They knew just what to do! We hope you're all feeling better! The CANINE CARNIVAL is almost here! Canine Carnival 2012 is on the way with even more animals and fun things to do including a live concert. 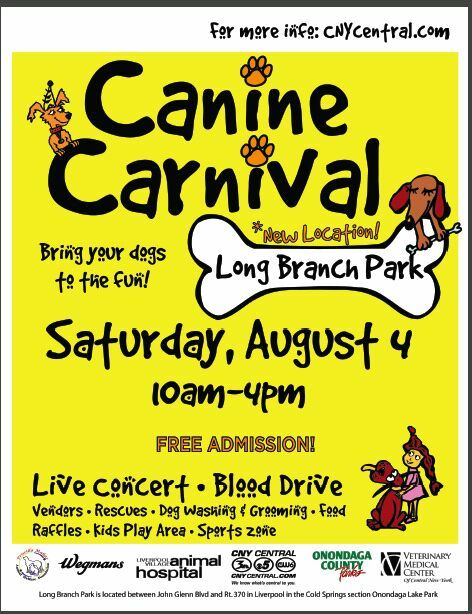 The date is Saturday August 4th 10am to 4pm at a new location, Longbranch Park in Liverpool. Admission is FREE. It will be held rain or shine. We encourage everyone to bring your pets. Last years Canine Carnival event was another incredible success with more than 50 vendors and animal rescues represented, food, music, 6000 people attending and best of all, more than 100 dogs finding good homes. Our new location features much greater parking capacity with many additional vendors and rescues being represented. Along with the live concert at 2pm, other new features this year include a Red Cross Blood Drive on site, dog washing & grooming, a Kids Play area and Sports Zone featuring local sports teams. Horse carriage rides around the park will be available. Spay & Neuter Syracuse (SANS) will offer micro- chipping for your pet. Veterinary Medical Center of CNY will have an emergency triage center on site for your pets. Proceeds from the Canine Carnival go to the Priscilla Mahar Animal Welfare Foundation who has donated nearly $30,000 to animal welfares and rescues in central NY. VMCCNY is proud to sponsor this event and look forward to seeing you there!